Chayote is a summer squash that originated in Mexico and Guatemala but has since spread into many other cuisines. 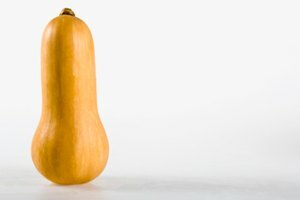 The squash is used in the Cajun cooking of Louisiana, where it is called mirliton, as well as Spanish, Caribbean, French and Vietnamese recipes. Chayote has a mild flavor and firm flesh that allow it to be used in a number of applications where it will take on the surrounding flavors. Boiling is a simple method for preparing and softening the meat of the chayote. A healthy chayote will be pear-shaped with wrinkled, bright green skin. Some varieties are also covered in small spines. The natural wrinkles on the skin grow heavier and deeper when the chayote is left to ripen on the vine for too long, so select the squash with less wrinkles. Peeling the chayote is optional, but if you choose to peel it be aware that the skin secretes a sticky resin when it's removed. Rinse your hands and the chayote after peeling to remove all of the resin. Cut the squash in half and remove the seed. The seed is edible and can be reserved and cooked along with the meat or thrown away. Cut the chayote into chunks. Bring a pot of water to boil. There should be enough water to completely cover the chopped chayote. Add the meat and, optionally, the seed, to the water. Allow the chayote to boil on high for about 8 minutes. 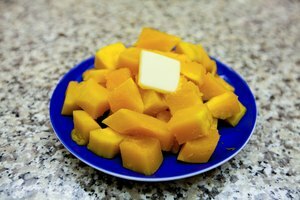 Smaller pieces of the squash will cook faster but you can test for doneness by piercing the meat with a fork. The chayote should be tender but still slightly firm. On its own, chayote is somewhat bland. 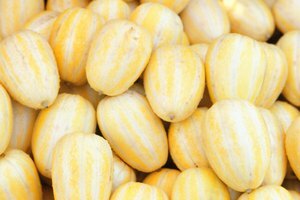 Season the boiled squash with salt and pepper or another combination of spices for a starchy snack, or allow it to cool and serve it over a salad. The softened meat will absorb the flavors of the dressing, especially if it is vinegar-based. Boiling the chayote in chicken broth or another soup will also give the squash more flavor and add a meaty element to the soup.